Christmas songs are part of the holiday season and set the mood at home or at parties. Because these songs are so familiar to most people, you can use them for Christmas fun aside from just listening to them. 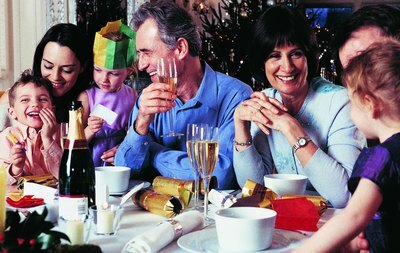 If you're hosting a large gathering, games you can print off and play that center on Christmas songs keep everyone occupied without a lot of hassle or expense. Christmas Song Lyrics is a printable game from the Christmas Games A to Z website. Lines from well-known Christmas tunes are on a single sheet of paper. However, the lines are incomplete, with some of the lyrics missing. Each guest has to fill in the missing lyrics. This game tests how well people really know their Christmas favorites. You can play this game in different ways, such as giving a prize to the person who completes the list first. Another option would be to ignore the usual lyrics and turn the game into a mad lib, where guests share their creative endings to the lyrics. The Christmas Games A to Z website charges a small fee for their version of the game, but you easily can create one yourself for free using any word-processing program. Christmas carols usually are easy to recognize by their titles — that is, unless all you have of the title is the first letter of each word. In the Christmas Carol Song Quiz on the Bow Tie Products website, each player receives a list that has traditional Christmas songs reduced in this way. To the right of the letters that abbreviate the title, there are blanks, one for each word in the title. Players have to use the letters to figure out the full title and then write the title in the blanks. Christmas songs sometimes are so ingrained in Christmas tradition that it is difficult to think outside the box with them, people get used to the way the songs sound or are used. Guess the Original Christmas Song Titles is a game from the Diva Girl Parties and Stuff website that challenges players to make unusual connections to their favorite carols. You print off a list that has phrases that rename or describe Christmas songs. For example, "Silver Bells" is listed as "Sterling Carillon." Players then have to guess what song the phrase represents.